coming up on time to think of making Christmas presents, and these ranges are perfect for quilts and playmats for childrens' rooms! 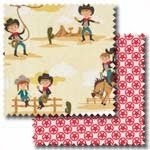 First up is the Sasparilla patchwork fabric range - designed by October Afternoon for Riley Blake Fabrics and featuring sheriff's stars, plaids and 3 main fabrics featuring cowboys and cowgirls riding, using lassos and chilling out on the plains, this collection is perfect for any kids who love the Wild West! 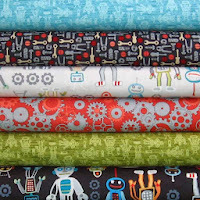 The other new range of novelties recently added is the Mr Roboto fabric collection by Studio e Fabrics. If you have a youngster interested in mechanics and robots, this range is perfect, featuring robots, cogs and tools, as well as novelty blenders - also available in a discounted fat quarter pack. 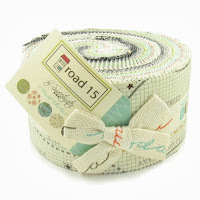 Finally, this month's Moda bundles have arrived - the Road 15 jelly roll and layer cake is designed by Sweetwater, a mother and 2 daughter team. This collection is inspired by their childhood home, and has prints including streets of houses, cottonwood trees and maps, as well as a selection of blenders, all in understated colours and creams.